Darren Ambrose scored a dramatic late equaliser as Charlton recovered from two goals down to rescue a point. The Hornets led 2-0 at half-time after Hameur Bouazza finished from close range and Damien Francis powered in Tommy Smith's cross. But Charlton pulled a goal back through Luke Young's superb finish. Ambrose completed the comeback in the 89th minute when he headed in at the far post from Alex Song's cross before Kevin Lisbie wasted a chance to win it. Defeat would have been heart-breaking for Watford, who produced one of their best displays of the season. A draw was enough to see them climb off the bottom for the first time since December, but the gap to safety remains a distant 10 points. 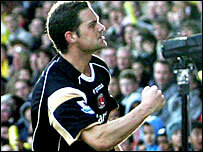 A point was also of little use to Charlton, now six behind 17th-placed Manchester City, who have two games in hand. Tha Addicks, so impressive in their 4-0 thrashing of West Ham seven days earlier, were forced into changes, with Ben Thatcher and Marcus Bent injured and Souleymane Diawara suspended. Jimmy Floyd Hasselbaink replaced Bent, while Osei Sankofa and Jon Fortune came in at the back. Watford boss Aidy Boothroyd had no new injuries but after a dismal performance against Everton, he opted for a change in formation and personnel. Tamas Priskin came in as a lone striker, supported by Smith and Bouazza, while Gareth Williams got a chance in midfield. The changes enlivened Watford, while Charlton were off the pace from the start. Gavin Mahon and Priskin had already wasted decent chances before Bouazza gave the hosts a deserved lead after 15 minutes. Hungarian international Priskin delivered a superb cross and though Carson brilliantly saved Francis's header, Bouazza was on hand to finish. Six minutes later it was 2-0 as Smith drifted to the left and dinked a delightful ball in for Francis to steal in at the far post. The Addicks, who might have shipped a third had Francis connected with Bouazza's low cross, needed changes. Pardew, not surprisingly, opted to bring off Hasselbaink, who had an awful first half, and replace him with Zheng Zie. Matt Holland should have pulled one back on 65 minutes but from Song's beautifully-weighted pass, the midfielder stabbed a shot over the bar with only keeper Richard Lee to beat from eight yards. Song, though, was at it again a minute later, this time providing the pass for Young to slide home. The home fans, who saw their side squander the lead against 10-man Wigan, were understandably nervous but Watford seemed to have weathered the storm and were the more creative going forward until Ambrose's intervention. Song passed to substitute Dennis Rommedahl, who crossed for Ambrose to head in at the far post. Lisbie had a chance to win it in stoppage time but dithered and allowed Lloyd Doyley to block but a win would have been much more than Charlton deserved. "In terms of it being a killer blow, that's nonsense. "In the first half we were the better side by a long way but it is not a 45-minute match it's a 90 one. "We were 2-0 up and playing very well. I knew there would be a storm in the second half and we weathered it but it is that winning mentality we lack." "It was a great fightback by us. "The players are a little bit dejected because of Kevin Lisbie's last-minute chance but I have told them this is still a win for us. "We have got two home games coming up, and this point could turn out to be very useful. The gap isn't huge." Watford: Lee, Mariappa, DeMerit, Shittu, Stewart (Doyley 46), Smith, Mahon, Williams, Bouazza, Francis (Cavalli 63), Priskin (Henderson 88). Subs Not Used: Loach, Kabba. Goals: Bouazza 15, Francis 21. Charlton: Carson, Sankofa, El Karkouri, Fortune, Young, Ambrose, Holland (Lisbie 78), Song Billong, Thomas (Rommedahl 86), Hasselbaink (Zheng 46), Darren Bent. Subs Not Used: Randolph, Faye. Goals: Young 67, Ambrose 89.